A blood-curdling scream rung out across the room at the Shocka-Con Horror and Sci-fi Convention in Charleston, West Virginia, and TapSnap franchisee Dave Ramsburg jumped. Another scream echoed in response and soon the Haunted Barn filled with screams as the ‘Scream Queens’ – famous B-movie actresses and others took part in a spontaneous screaming contest, a spectacle that happened several times throughout the three-day event. “All weekend long there were zombies, vampires, and mummies wandering around,” says Dave. 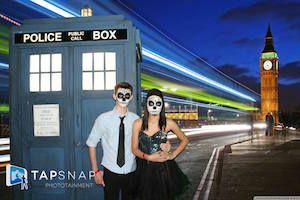 Many of these gruesome monsters had gone all-out for the occasion, and were thrilled to be able to capture their outlandish costumes with TapSnap, so much that they waited in a long line to do it. 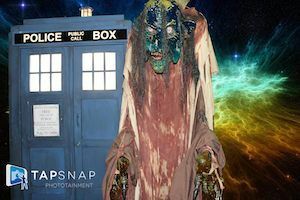 They posed with the TARDIS time machine from the Dr. Who television series against an outer space background among others, taking advantage of TapSnap’s green screen technology. TapSnap’s popularity at the event shows that the system is a natural fit for any event involving costumes and monsters, and (hint, hint!) that TapSnap would make an exceptional Halloween photo booth. The success has also led Dave into a niche market that’s a little unconventional and more fun than one TapSnap franchisee should be allowed to have. It all started when a friend who owns a comic book store suggested Dave do a local event called West Virginia PopCon, short for Popular Culture Convention, which focuses on comic book and sci-fi culture. His friend even built Dave a TARDIS, a replica of the time travel machine from Dr. Who. “We did a two-day event at PopCon and it led to nine days worth of events,” says Dave. From that one event, he booked the Pittsburgh Comicon on September 27 to 29 and the First Annual West Virginia Tattoo Expo on October 11 to 13, as well as Shocka-Con, which took place September 20 to 22. From Shocka-Con he has a lead for another Halloween event, Fright Nights, which runs various evenings in October at Glade Springs Resort. It just goes to show that sometimes markets for your business come from where you least expect to find them. And that TapSnap is one frightfully awesome Halloween photo booth.